I love everything about this - it's dressy but not too fancy, it can easily be made into a more casual look and the color palette is one of my favorites for fall. This peplum sweater is my most warn cardigan in my closet - it's so perfect year round and an awesome layering piece! I'm also in LOVE with block heels, and I haven't seen such a cute gray pair like these. Fall weddings can be so hard (especially if you're not in the wedding) to dress for. I like wearing colors other than black for weddings (as much as I love a good LBD), but in the fall colors can be limited for dresses. The color of this lace dress is my fall go-to and it's easy to throw a cute jacket/sweater over if its cold. I love black and gold with olive green, and I'm beyond in love with this Tory Burch bag! I bought it a few weeks ago and it's even prettier in person. It's SO worth the price and the perfect size, especially for a wedding! You can even use it as a clutch to make it dressier. This is my favorite thing to do in the fall! I try and go so many times because there's nothing better than apple cider donuts and the colorful leaves - I just can never get enough. I made the mistake once of wearing a brand new pair of shoes and nearly ruined them in the dirt at an orchard, so now I'll only wear Hunter boots. They're easy to clean and they look so cute! It's no secret that I'm obsessed with vests and layering with them, and the J.Crew excursion vests are my favorite things to buy, EVER. I'm obsessed with the style, fit and colors and they last for forever. Side note: for a warmer and cheaper option, I'm LOVING Old Navy's frost free vests. They come in so many colors and when they're on sale, they're around $25! This color combo is my favorite for fall I think - I know I say that a lot but I can NOT get enough of fall colors! P.S. has anyone tried the Essie gel couture colors? I LOVE this Caviar Bar shade, and I would love to be able to do my own gel in between mani appointments, so I'd love to hear what you think of them?! 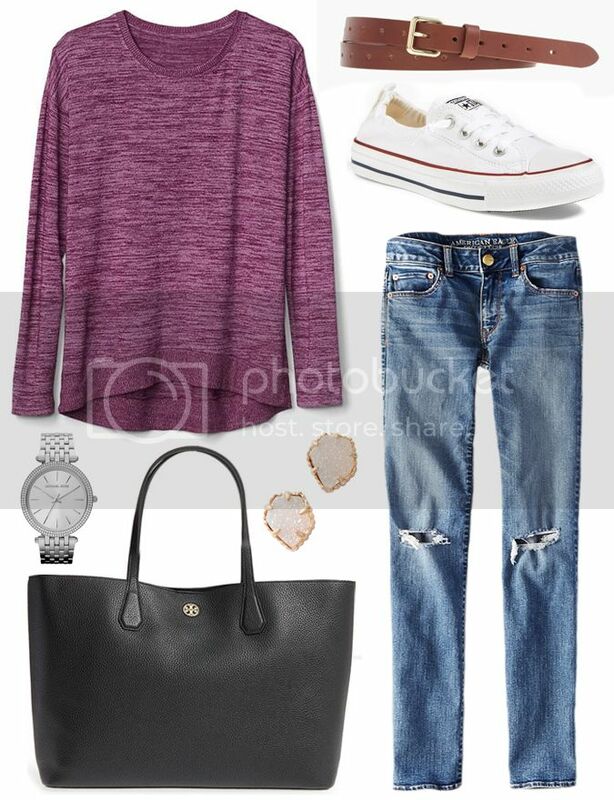 I mean, doesn't everyone need a cute but comfy fall shopping outfit? I shop a LOT in the fall (as opposed to the rest of the year...? LOL) and I find it so hard to dress for a day in the mall this time of year - if it's cold out, it's likely really warm in the mall. My all time favorite Converse and shoes in general are these Shorelines. I wore them throughout Sicily this summer and they're comfy, practical and so cute! And if you're looking for some cute knit tops this season, go to Gap! This top comes in a ton of colors and it's light but can be layered. Love! It's Jingle Ball season! I LOVE concerts this time of year and this is my favorite type of outfit for a fall concert. I also love it for a night out in the city or even to a party. These lace up flats come in a few colors and they're surprisingly so comfy - I love the olive color of these. You can't go wrong with a color palette like this! Plaid and leopard together is my new favorite pattern combo! I'm obsessed with it and I don't know why I haven't seen much of the combo before this season, but I'm so glad it's so in style because it's SUCH a cute look. If you're looking for blanket scarves, I HIGHLY recommend checking Purple Peridot - I get so many of mine from there; Express too! And this season, just go with a berry colored lip shade and you'll be good to go, no matter where you go. I love MAC lippies - the gloss in shade Oh Lady is my favorite! What other looks would you add to this list? I'll be adding more looks from time to time, and I'd love to hear what you'd like to see included! Do you have a go-to look or color for fall? Oh I love the apple picking and concert looks! I tend to always wear light sweaters and plaid shirts in the fall, they're so easy to throw on and look cute too! Great outfits! I love fall colors, and especially love that green lace dress. I need a pair of Hunter boots too. You have such great taste in shoes! I'm dying over those black lace up heels! I'm a big fan of the first gray heels and the lace-up flats as well. Love all the looks! Love the plaid pieces, and those booties are really cute! LOVE this post girlie! Hope you are well! I love leopard ..of course..he eh, but never tried it with plaid..I will have to check that out! I love all of these outfits, but my favorite is definitely the apple & pumpkin picking one!! So many cute ideas! I love that tassel fringe clutch! I love fall fashion especially because you can mix and match so much. I loved the "concert" outfit. Super cute really love your taste and style, want is all! I just need TX to cool down so we can enjoy it. Oh you really have a great taste in fashion! They are all so awesome! You seriously have the best taste. I always love your choices! The vest, the bags, the tassel earrings. Love it all. I'm in love with peplum blouses and dresses so that sweater is awesome for me. Love your style! Thanks for sharing these outfit ideas! I love the sweater and scarf in that last image. I really like the colors of that scarf. Wonderful outfits here! Oh my goodness, I'd wear any of these outfits. I love how they are paired and the looks are making me excited for fall wardrobe updates. So much cute outfit inspiration! I always appreciate these posts, because fall weather is so fickle, and it can get overwhelming trying to put together a look. YES to all the items that you have here! I love comfortable clothing during this season. I also love wearing boots! Flannels are SO the way to go! I usually wear leggings with them. 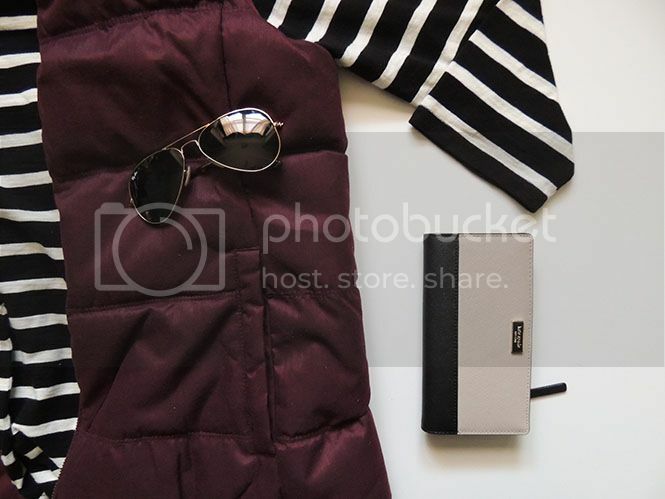 Such a great picks and these are all are perfect for fall fashion. I realy like the outfits that you have created! The Apple & Pumpkin picking and the Day of Shopping ones are my favorite. I love those top two outfits, they're right up my alley in terms of style! I am loving the fringe bag in the first look and the plaid scarf in the last! So many cute things to choose from. Of course I especially love all the tassel pieces. I'm still obsessed with them. I need to add a few to my fall wardrobe. I also really want a puffy vest and plaid shirt in the traditional colors. SO many cute looks! I love the peplum sweater from the first one. The apple & pumpkin picking outfit is my favorite of the looks. I love a good plaid shirt and rain boots. I am going to share this post with my sister because she is always in the hunt of different outfits; in fact her Facebook wall is full on fashion outfits and ideas. Oh, my! 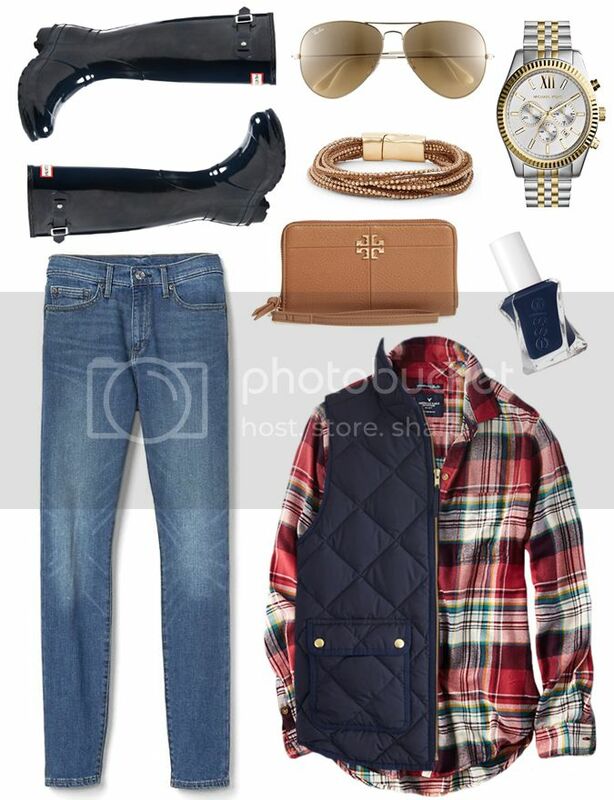 These are awesome fall outfit ideas. Boots and cardigans are two of my faves. Thanks for sharing! This is a lovely collection of outfits! I think it's awesome to have sweaters that are comfy along with jeans and boots during this season! I'm glad flannel has made a comeback in recent years.It's perfect for Fall! I am loving all of these looks you put together! I especially love the apple and pumpkin picking look! So cute. Your post makes me want to go shopping! I haven't bought a new clothing item in forever – all my spending for the past 15 months has been on furniture and home decor, what with our house renovation and all. I love all of these outfits! Love all of your tassel earring picks!!! I'm so about that trend. These are all great looks! I have the booties in the last outfit and I love them! AuthenticWatches sells authentic brand name watches, with authentic watches listed with a HUGE discount. The manager was prompt to respond to any question I had, patient with all my bridal anxiety, and most importantly, the entire wedding was managed flawlessly (as was our rehearsal). The wedding venues food was amazing, and the venue was gorgeous.